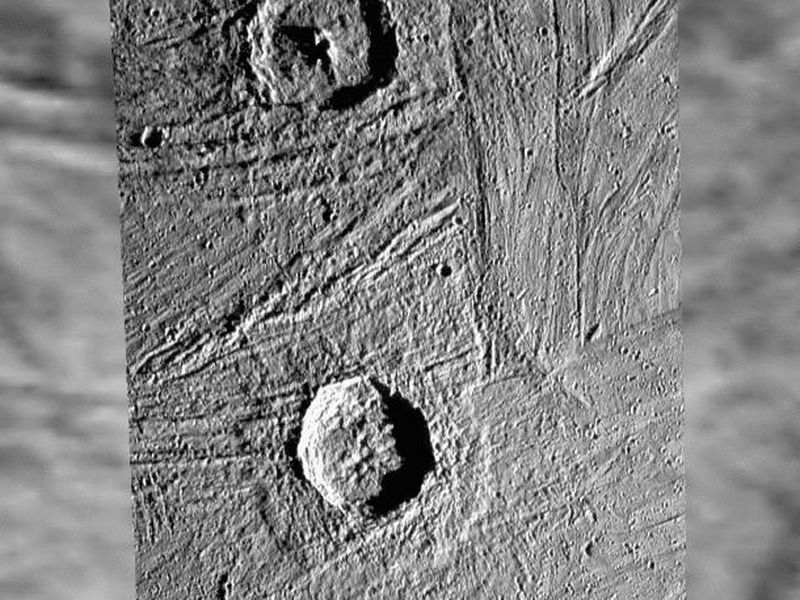 This image shows a Galileo high-resolution mosaic of craters Gula (top), about 40 km (25 miles) in diameter, and Achelous (bottom), about 35 km (21.8 miles) in diameter, projected on a lower-resolution background of image data that were obtained in the late 70s by the NASA Voyager spacecraft. The two Galileo frames used for the mosaic of Gula and Achelous were taken under low sun elevation in April 1997 during Galileo's 7th orbit around Jupiter with the Solid State Imaging (SSI) camera system onboard this NASA spacecraft that has been orbiting Jupiter since December 1995. 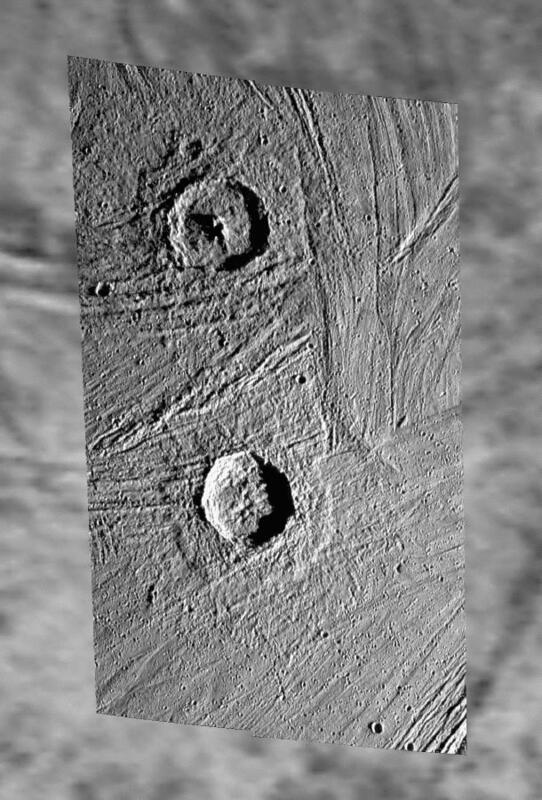 The images were taken from a distance of about 17,500 km from Ganymede. The pixel resolution is about 180 m/pixel - the smallest features that are still discernible are about 360 m across. The sun illuminates the scene from the right. North is pointing towards the top of the Galileo mosaic. Both craters are situated between 60 and 65 degrees northern latitude at about 12.5 degrees western longitude. A characteristic feature of both craters, almost identical in size, is the "pedestal" - an outward-facing, relatively gently sloped scarp that terminates the continuous ejecta blanket. Similar features may be seen in ejecta blankets of Martian craters, suggesting impacts into a volatile (ice)-rich target material. 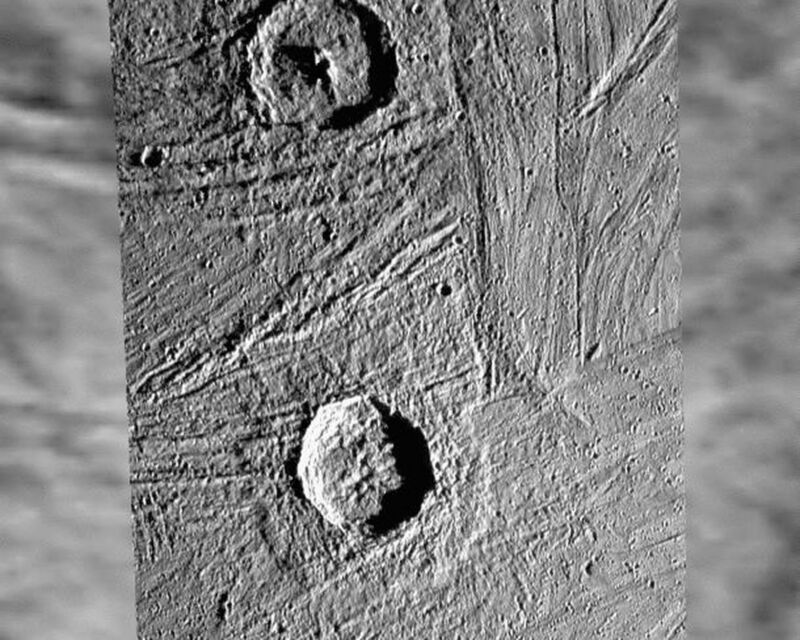 Furthermore, both craters appear crisp and feature terraces. Gula has a prominent central peak; Achelous instead may show the remnant of a collapsed central peak or a central pit that is not fully formed. 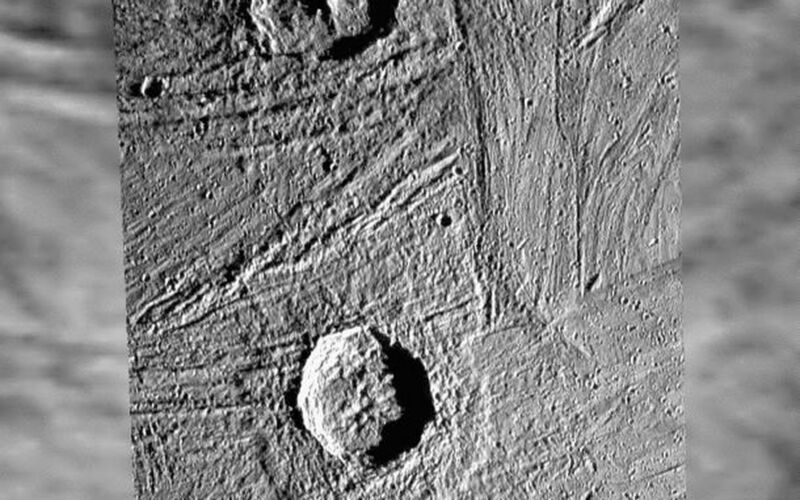 On lower-resolution images taken under higher sun illumination angle, both craters are shown to have extended bright rays, especially Achelous, which demonstrates that these two craters are younger than the respective surrounding landscape.